If there’s anything I’ve learned about Berlin, it’s that everything has a history. Everything. And if something looks a little out of the ordinary, that’s because it is. We’re trying to explore as much of Berlin as we can. We’ve covered kilometre after kilometre of pavement, parks, forests, derelict ground, rubble mountain and former death strip. We’ve found ourselves in some strange nooks and crannies – looking up, down and around and wondering what the stories behind them might be. A few weeks ago we went for a walk around Rehberge and Tegel Airport. The walk took us to the far western end of the airport’s perimeter fence. At the end of the runway, hidden behind a patch of woodland is a big old Boeing 707. There are lots of old and retired planes used for airport training purposes but this one doesn’t look like any of those. There are no signs of smoke damage or any fire and rescue training facilities nearby. It’s dressed up in 1960s era Lufthansa livery, looks long-forgotten and, like so much of this city, a bit odd. Boeing 707s date back to that golden age of airliners and passenger jet planes. If you’ve seen black and white photos of Jimi Hendrix or Bob Dylan boarding planes in the 60s, they’re probably getting on board a 707. And if you’ve ever been able to sit through an episode of Pan Am, they’re flying on a 707 too. They’re before my time but I know 707s from only one source – Peter, Paul and Mary’s version of Early Mornin’ Rain. I think Dylan covered it too but the song was written by Gordon Lightfoot after a watching his friend fly home on a 707. He remained stuck on the ground, drunk and unable to afford the airfare. Anyway, after a few days, I finally remembered to Google Tegel’s 707. 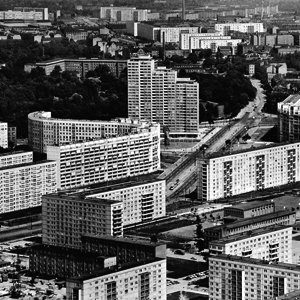 Typically for Berlin, it has a pretty amazing story to tell. Tegel’s 707 was involved in a famous international hijacking incident involving five planes and the Popular Front for the Liberation of Palestine (PFLP). They became known as the Dawson’s Field hijackings. Tegel’s 707 was originally made for the Israeli national airline, El Al in 1961. On 6th September 1970, it was flying as El Al flight 219 from Amsterdam when it was hijacked. Three other planes were also hijacked (TWA flight 741 from Frankfurt, Swissair flight 100 from Zurich and Pan Am Flight 93 from Amsterdam). 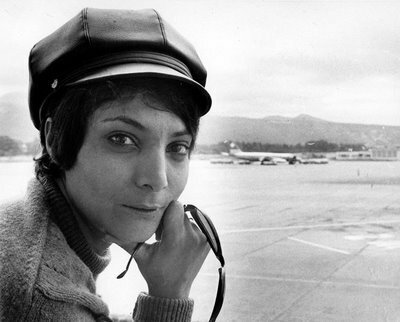 Our 707 was hijacked by only two terrorists: a South American revolutionary called Patrick Argüello and a woman called Leila Khaled (pictured below). They were supposed to be part of a larger team but their co-hijackers weren’t able to board the plane – so they hijacked Pan Am flight 93 instead. In the chaos that followed, a grenade failed to detonate and Argüello (pictured below) exchanged fire with an Israeli security guard on board. El Al steward, Shlomo Vider, was injured by a stray bullet. Some reports say that Argüello was killed in this exchange, others say that he was shot by the security guard after he’d been restrained, either way, he died at some point during the flight. Leila Khaled had removed the pin from her grenade but passengers jumped on her and prevented her from detonating it by holding her fists together – and eventually replacing the pin. With the hijack effectively over, the flight was diverted to London Heathrow where Leila Khaled was handed over to the authorities. But soon after, the PFLP hijacked a British BOAC plane and diverted it to Dawson’s Airfield in Jordan. In return for the safe release of the BOAC passengers, Khaled was handed back to the Palestinians. Passengers of the Swissair and and two Pan Am planes were also released without harm at Dawson’s Airfield. The same can’t be said of the actual planes – they were blown up. The Tegel 707 continued in service for El Al, then for another Israeli airline called Arkia. In the mid 1980s, Boeing bought it back and gave it to West Berlin as part of the city’s 750th birthday celebrations. Lufthansa had bought its 200th Boeing plane at around that time so, as thank you, Boeing re-painted the Tegel 707 in Lufthansa’s 1960s livery. But as West Berlin airspace was still under Allied control in the 1980s, Lufthansa weren’t allowed to fly into Tegel. In fact, no German airline or even a German pilot could fly anything in West Berlin so the plane’s new colours were covered with white stickers and delivered by an American crew at night. By the morning, the stickers were pulled off and Tegel passengers were amazed to see a Lufthansa 707 sitting on the tarmac. NB. This Allied airspace agreement even applied to West Berlin’s ADAC rescue helicopter (currently outside Berlin’s Fire Service Museum) which was only flown by an American pilot. Eventually, issues around maintenance costs, a suitable publicly accessible site and vandalism pushed the 707 airside – safer and cheaper but out of any meaningful public view. The plane is occasionally used for evacuation training. So, that’s the story of Tegel’s hidden 707. Strange, huh? I always feel sad to see something that isn’t being put to its intended use. This even applies to old record players or tennis rackets at a flea market. An old chair looks like it’s dying to be sat on again and to me, Tegel’s 707 looks like it’d would love to be flying people around the globe again. I’m sure there are all kinds of reasons why this will never happen. The words of Early Mornin’ Rain came into my head when I saw Tegel’s 707. I’ll think of the 707 every time I play that song. …hear the mighty engines roar, see the silver wing on high. I got loads of information from here, various other sources and the Dawson’s Field hijackings page on Wikipedia. nice story, and enjoyed the PP&M link. I collect (sort of) songs that feature Boeing airliners. Great story Ian. Nice work with research. The image of the Pan Am planes being blown up in the desert is one which I remember both terrifying and fascinating me me when I saw it as a kid. This entry was posted on 27/03/2012 by hawkinsian in Tegel, Uncategorized and tagged Boeing 707, plane hijacking, terrorism.